The first exhibit against a backdrop of Garage Nation posters was impossible to miss: the audacious matching shirt and trousers combo of the Moschino clad mannequin, belonging to Saul Milton of Chase and Status who it transpires is an avid collector of vintage nineties clothing. Britain and Italy have enjoyed a mutually beneficial sartorial relationship for years. Think Mods and their Italian tailoring sat astride Vespas in the sixties; then in the eighties, football Casuals and their buying trips to Italy for sportswear and a Paninaro-influenced wardrobe. Italian fashion has always been “look at me”, and Moschino’s clothes were the perfect outward signifiers that as part of the garage scene you were stylish and moneyed. 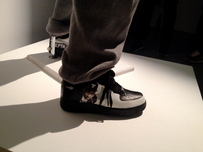 The following two displays were cleverly curated to indicate sartorially and musically where things went from here: Man Like Me’s geezer-pop look, all clashing prints and Reebok Classics; and Skepta’s grime get up consisting of head-to-toe Academiks and conspicuous personalised Nike hi tops. 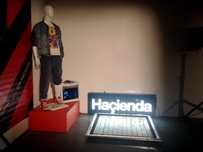 If these first scenes were all about the right garms to stand out from the crowd, the next exhibit of what you would find ravers at Manchester’s Haçienda and London’s Shoom wearing was a more accessible look. Baggy and Acid House wardrobes were born out of a need for comfort whilst dancing all night inside a hot sweaty club, and the hippy values of love and unity. The smiley face logo that became synonymous with the era was lifted from a Shoom flyer. 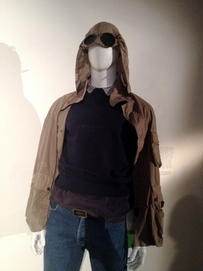 The (in)famous football Casual look was also rightly here, the mannequin dressed in iconic CP Company goggles parka (a design classic), with a preppy shirt and jumper, straight leg jeans and deck shoes completing the look. 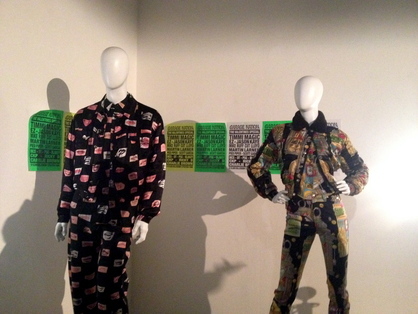 A lounge area showcased ‘What We Wore’, a photographic ‘People’s Style History’ project curated by Nina Manandhar. While the exhibition itself was by no means an exhaustive documentation of style subcultures, focussing instead on the streetwear tribes, Manandhar’s work means we get a glimpse inside the wardrobes of the ordinary teens that were at the Brit Pop gigs, Northern Soul all-nighters and Nu Rave parties and continues a conversation that this exhibition started. The exhibition ran from 6-8 December but if you missed it, you can buy the What We Wore book now.